The UN marked the 2 November 2014 as the first annual International Day to End Impunity for Crimes Against Journalists, and it has created a Plan of Action on the Safety of Journalists and the Issue of Impunity that will be implemented in several countries. The UN also reports biennially on the Safety of Journalists and the Danger of Impunity, providing an update on prominent cases. This month, the Southeast Asian Press Alliance (“SEAPA”) is also taking action against impunity. It has released an infographic in advance of its other upcoming actions such as public dialogues and a media information kit. The International Federation of Journalists (“IFJ”) is also carrying out a range of activities, such as gathering video messages from victims of impunity or their families calling for justice. November offers the opportunity to learn more about impunity and join the fight against it both in Cambodia and around the world. By heading to IFEX’s website, a global network defending and promoting free expression, you can check out a series of online resources such as an impunity “hotspots” map, an infographic, an interactive game, and two factsheets on the above mentioned UN mechanisms. In Cambodia, many groups beyond journalists face impunity, such as activists, protestors, union leaders, or those who have faced abuse at the hands of the powerful and have been denied justice. While a culture of impunity is generally created and sustained by the most powerful within a society, everyone has the capacity to stand up and call for justice. You too can take action and become a part of this fight against impunity. Send a photo of yourself with a sign to fight impunity to the Cambodian Center for Human Rights (“CCHR”), and be part of a massive photo petition that will be delivered to the Cambodian Ministry of Justice on 2 December 2014, calling on the Royal Government of Cambodia to end impunity here in Cambodia. Alternatively, check out the photos others have sent here and share them, and be part of the global movement against impunity! 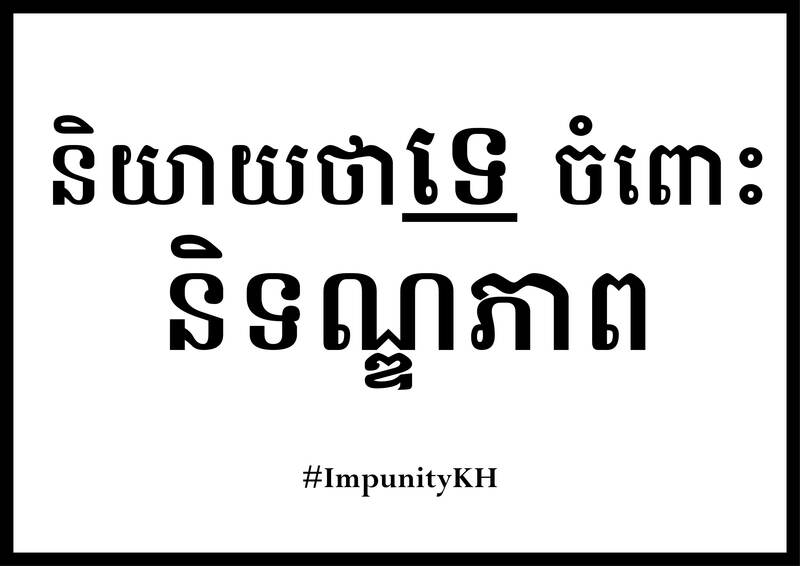 To participate in CCHR’s campaign and become a part of this movement to end impunity go to www.cchrcambodia.org/Impunity2014. This entry was posted in Impunity and tagged Cambodia, Campaign, Human Rights, IFEX, IFJ, Impunity, International Day to End Impunity, International Day to End Impunity for Crimes against Journalists, journalists, Royal Government of Cambodia, SEAPA, Southeast Asian Press Alliance, The International Federation of Journalists, United Nations by Cambodian Center for Human Rights. Bookmark the permalink.